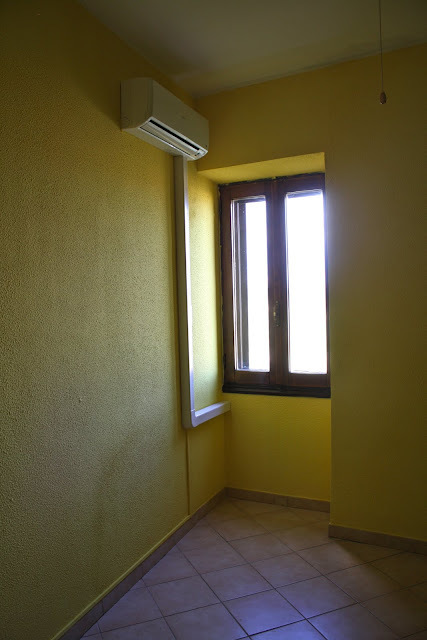 Making Room: Our Life in Sicily: finally... our house! At long last I have some pictures of our beautiful house in Sicily. We've been living in temporary housing for the past 7 weeks while searching for a home and then waiting for all the improvements to be completed. Yesterday, at long last, everything was complete. We are free to move in! So I'll interrupt my previously scheduled program of pictures of Venice (the weekend there was ah-mazing!) and share some photos of our house first. The house is located a 10-minute drive from the base in a little town called Motta Sant'Anastasia. The photo at the top of my blog is a picture of that town. Our house is located on the cliff's edge just under the castle. Our landlord and landlady invited us up for lunch while we were in the house waiting for a delivery of some military-issued furniture (fridge, washer, dryer, etc.). Lunch was interesting because we speak very little Italian and our landlord and landlady speak no English. At all. Somehow, though, we had a wonderful time over chilled red wine, fresh pasta, roasted eggplant, peccorino cheese, Italian bread, caprese salad, olives from her brother's groves, and summer peaches. Back downstairs, we were walking through the front door. The balcony is straight ahead; the door on the right is to our first bathroom. The fireplace is directly to your left; you can see the edge of it. The hallway on the left side of the living room leads to our bedrooms. Here's a view from the other side of the living room, standing near our bathroom door. The art on the wall is an original by a friend of our landlord. Now out to the balcony. Elliott looks out over the valley to the Mediterranean. Now he walked down the balcony past the second bathroom window to the door to our bedroom. That faux owl has been very good at keeping pigeons off the balcony thus far! Now we're in our bedroom. Elliott's standing in the balcony door. There's also a small third bedroom/guest room, but there's not much in there, so we'll skip that. And now the kitchen! The kitchen is directly to your left when you walk in our front door. Don't you love that gorgeous long farmhouse table?! It comes with the house and was one of the reasons we decided to rent it. And now in my kitchen! We picked this kitchen out ourselves in IKEA with our landlady. Second time in my married life that I've been able to design my own kitchen! We love every detail. The view from our kitchen window. That's Mt Etna, the volcano, in the not-so-distant distance. Looking back the other way at the table and cabinets. 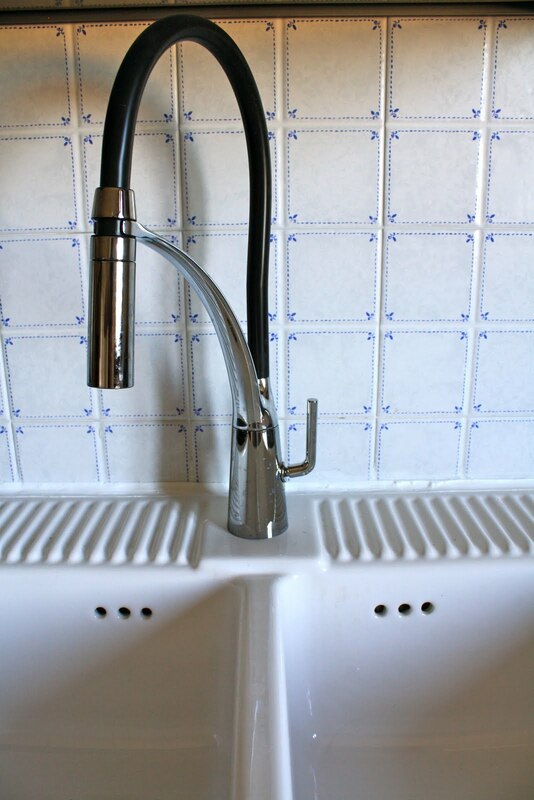 Detail of our sink, faucet, and the beautiful backsplash that our landlady chose for us. Italians put drying racks inside the cupboards over the sink. How brilliant is that? 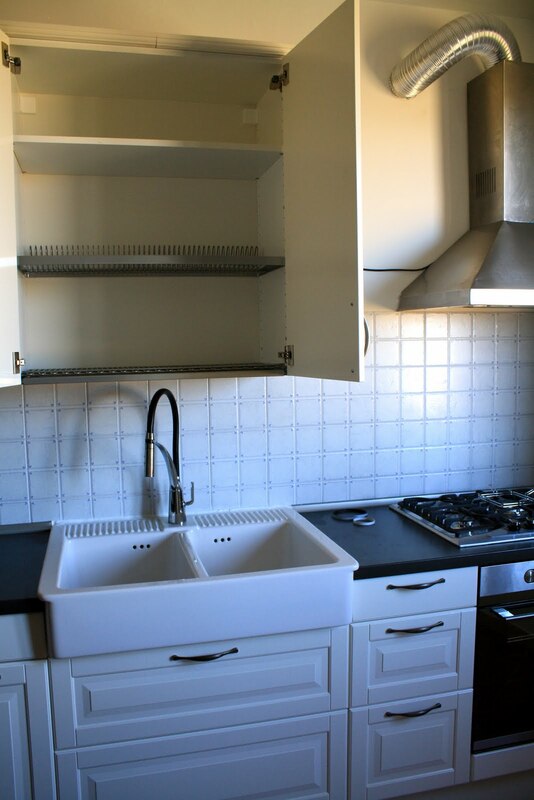 The built-in cupboards under the built-in countertop. We'll hang a curtain in front of the cupboards. Lena, Elliott, and I can't wait for lots of fires in the fireplace this winter! Wow, it's so lovely and roomy. I can picture your farmhouse table full of guests. The view from the balcony is breathtaking, isn't it? A little different from the view you had from the balcony when you were Lena's age, the balcony from which you spit out your pacifier. I loved being able to tour each room! So excited for you ALL. I feel like I just watched an episode of International House Hunters. Love it! So excited for you guys! Sadly, the only room not pictured was my room..where I'll be moving in just less than 12 months. wow, hard to believe. anyways, can't wait to see you this weekend!